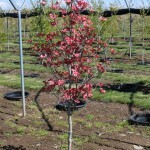 This is a small, slow growing, low branched tree with deep pink bracts before the foliage appears in the spring. The dark green leaves, emerge with some red tones, and then turn bright red in the fall. The fruit is bright red and attractive to birds when produced. 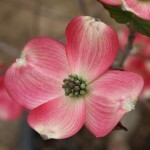 Flowering Dogwoods prefer moist, well-drained soils in full sun to part shade.It benefits from properly applied mulch to help keep the roots cool. The species is native to the eastern U.S.